The Karen National Union (KNU) recently formed the “Committee for the Emergence of Peace” with the aim of holding peace talks with the Burmese government. On Nov. 19, soon after the committee was formed, three of its representatives held talks in northern Thailand with a Burmese government delegation led by Minister Aung Min. Saw Yan Naing, a senior reporter for The Irrawaddy, interviewed KNU General Secretary Zipporah Sein after the meeting. Question: What was the result of the meeting between members of the KNU’s Committee for the Emergence of Peace and the Burmese government delegation? Answer: We do not have any results yet, because we haven't had substantial talks yet. It was only an informal meeting and discussion. We haven't reached any agreement yet. Q: Why were all seven members of the Committee for the Emergence of Peace not involved in the meeting with the delegation led by Aung Min? Are there disagreements within the KNU leadership regarding the peace talks? A: It was not necessary for all seven members to get involved in this meeting. It is the beginning. So the Committee members elected to send only three representatives to participate in the meeting. These negotiations are complicated, so of course there are differences of opinion regarding strategies. However, we have come to an agreement within our leadership and we are ready to go forward with talks. Q: Witnesses to the meeting said the KNU representatives didn’t signed any ceasefire agreement in the meeting, but agreed in principal to a ceasefire with the government. Is this true? A: Actually, that is not true. The meeting was informal and there was only informal talk. Nothing came out about any agreement yet. The agreement can only happen after we have more substantial talks. Q: There is speculation that some KNU hardliners and some pro-KNU persons were not happy about the recent peace talks, which were led by KNU Central Committee member Saw David Taw. Is that true? A: Everybody made the decision to establish a Committee for the Emergence of Peace together at the recent meeting of the KNU Central Standing Committee and everyone is satisfied with the outcome of the meeting to start negotiations for peace talks or ceasefire talks. David Taw and the team were appointed to go to this informal meeting with the representative of the government of Thein Sien by the Committee for Emergence for Peace. 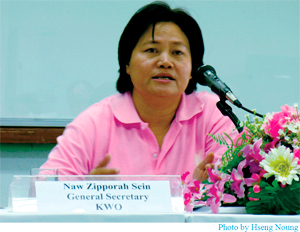 The KNU already has a clear policy regarding negotiations to resolve political problems and opening the door to talks. The KNU has always been willing to participate in solving political problems in Burma to bring peace and equal rights for all. the recent talks. What was his role? A: I think he is the advisor of the Ethnic Nationalities Council. He is willing to recognize equal rights for all ethnic nationalities for Burma. that it is hard to meet with all ethnic armed groups together at the same time because they have different demands. What is your response to that? A: We ethnic people all need equal rights and equal participation. President Thein Sein said ethnics have different demands, so the government is unable to fulfill. This word has been used as excuse for a half century. So now ethnic groups come up with a new idea UNFC alliance to speak one voice. The lier Thein Sein now said the government doesn't want to talk with the UNFC. So what is the point? Big lier government, always simply try to distort the real fact and avoid meaningful dialogue for political solution. Thein Sein lier! The Burmese regards each "Peace Negotiation" as a business deal. Business people will give in. Isn't that what UNFC is for? to speak in one voice with unison so that they don't say things like that. This government is a joke. Just trying to protect their wealth. that it is hard to meet with all ethnic armed groups together at the same time because they have different demands. What is your response to that?My comment-I do not believe Than sein's words as he tries to twist the real facts. Whatever it is , all ethnics must be united OR you will be cheated by Than shwe's bama-nization.Signing or without signing Panglong does not mean all ethnics are belonged to Bama(General AS)in history.